It began innocently enough. I bought a rain barrel, recycled from its former life holding some undefined foodstuffs, so that I could support a charitable event. My city is celebrating its centennial with a series of water-themed events. This was to climax in a River of Light during which lighted rain barrels would be ushered downstream by dozens of kayakers. It was going to be magnificent. Unfortunately, nature (or global warming, or climate change, or God) intervened with a flood. The river was too high and too fast, and the river banks became unstable. So, the River of Light became an Artistic Installation of Light on higher ground. Actually, it was just as impressive as the original plan. More so, in fact, given the short time there was to make it happen. It was beautiful, dramatic, and interactive. Something for everyone. It’s not often you can have an artistic family friendly light-and-sound event in the middle of the night, if you don’t count Guy Fawkes night. Anyway, I bought a barrel ($70) to support the cause, and because I thought it would be very cool to have a water-and-light feature controlled remotely and changing colour at my will in my back yard. When I brought the barrel home, I presumed it would be a simple thing to put it under a drain pipe and let it do its thing. I was so naive. As soon as I put it in the vicinity of the downspout, I realized I had trouble. First of all, I had to raise it up so that I could put a watering can, or a plant pot, or a small child, under the tap that was within six inches of the ground. So, I went out and bought four cinder blocks ($13). They were ugly, but they did the job. However, because the cinder blocks were not pretty, I also bought a partial barrel ($15) to cover them up. Then, I couldn’t put the barrel and it’s cinder block/partial barrel base directly under the downspout because the side of the house is on a slope. I had to put it around the corner to the spout. In order to do this I had to ensure that the barrel would sit level. For this I needed to remove some patio paving stones and replace them with rocks. So, with only a momentary twinge of guilt, I used one of my children’s long-forgotten rock collections. I knew I had kept them for a reason. At this point I had to reconfigure the downspout so that water would actually go into the barrel. This would require two elbow bends. I went to the hardware store and bought the bends ($6), even though I could only get white or brown ones, instead of the black that would match the downspout. As soon as I took them to the corner of my house, I realized that I had bought rectangular elbows instead of square ones. Why is this so difficult? I took them back and replaced them with one square one. (In the interim I had realized I could repurpose a black elbow.) I asked the man at the store how to fit one inside the other when they are both the same shape. He said “You have to squish them. No, you have to squish ONE of them.” I thanked him for his advice. With great trepidation, I started to hacksaw the downspout. Once I had made a hole in it, I tossed all caution to the wind and used tin snips to cut off the drain pipe at the appropriate location. It wasn’t pretty, but I it worked. Using standard dressmaking techniques, I cut the corners and made metal darts, as if I were constructing a blouse. Squishing is for rookies. I put the narrow end of the drain pipe into the square elbow bend and, voila! I had created an engineering marvel. Great. Now all I had to do was wait for it to rain and watch my barrel fill. In my innocence, I expected this to take weeks. I could not have been more wrong. The next day we had an apocalyptic thunderstorm. It came with lightning, hail, and lots and lots of rain. My 50 gallon barrel filled in less than 15 minutes! Water was gushing over the top of the barrel and up against the house. It was a mess. I panicked. I’ve watched enough HGTV to know that it is not good to have water up against the house. Fortunately, I had the foresight to buy an extra hose ($3 from a recycling store) and was able to attach it to the overflow outlet. I was outside in summer clothes and flip-flops, getting very wet, with water falling all around me, water coming out of the overflow hose, and water still splashing up against the house. Today I bought an additional hose ($13 from a hardware store) and attached it to the outlet at the bottom of the barrel. 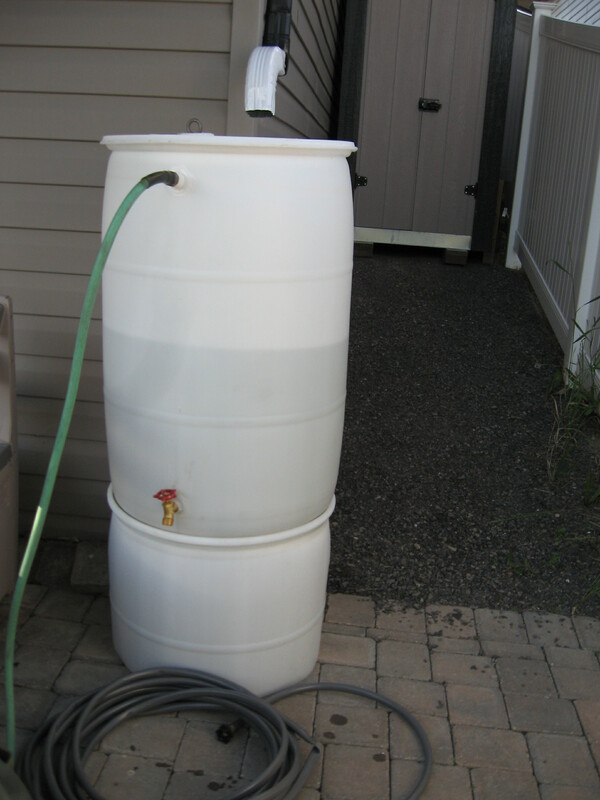 I used it to add yet more water to my shrubs and to half-empty the barrel. They say we can expect more rain tomorrow. Wow, that takes me back! Ha ha!